JERUSALEM (AP) — Israel’s Delek Drilling and its U.S. partner, Noble Energy, said Sunday the foundation of their rig for the Leviathan gas field has arrived, in the first stage of an ambitious project they say will wean Israel off coal and revolutionize its economy by turning it into an energy exporter. 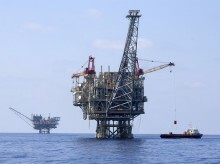 The foundation, known as the platform jacket, is being placed around 10 kilometers (6 miles) off Israel’s Mediterranean coast. It arrived on a 180-meter (590-foot) long barge that sailed for a month from Texas across the Atlantic Ocean. The platform’s jacket, which took 18 months to build, is nearly 100 meters (330 feet) high and weighs 15,500 tons. Labor Party leader Avi Gabbay attended the weekend protest and pledged his support, while Yesh Atid leader Yair Lapid, a top challenger to Prime Minister Benajmin Netanyahu, said there have been “essential flaws” in the decision-making process and that he would freeze the project immediately upon taking office.